Greetings again from Ireland. One of the many mysteries about the current crisis is why anyone listens to the IMF or anyone that supported its anti-regulatory policies. Prior to the crisis, even the IMF had begun to confess that its austerity programs made poor nations’ financial crises worse. In the lead up to the crisis the IMF was blind to the developing crises. It even praised nations like Ireland during the run up to the crisis, missing the largest bubble (relative to GDP) of any nation, an epidemic of banking control fraud, and the destruction of any pretense to effective Irish banking regulation. Crises reveal many deficiencies and one of the most glaring was the European Central Bank (ECB). The ECB was set up, unlike the Federal Reserve, to have only one mission and one function – securing price stability through monetary policy. The Fed has three missions and three primary functions. The missions are systemic financial stability, price stability, and full employment. The functions are conducting monetary policy, serving as the lender of last resort, and acting as a financial supervisor. The crisis revealed that both dominant forms of central banking could attain their most fervent goal – near total “independence” in determining and conducting monetary policy – and fail abjectly. The crisis revealed that the ECB’s narrow mission and function left the EU helpless to deal with a severe economic crisis. The ECB could not save Europe. Only the Fed could, and did, save Europe through currency swaps, serving as a lender of last resort (often on the basis of chimerical collateral) to major European banks, and providing liquidity backstops to myriad financial markets. The central financial crisis caused a series of national crises in the European periphery, initially in Iceland and Latvia. Individual European nations whose creditors were most at risk joined with the IMF to “bail out” these initial failures. The “bail outs,” however, followed the old, destructive IMF playbook. Greece then slid abruptly into crisis when the new socialist government revealed that its predecessor conservative government (sometimes with the aid of God’s dragoons – Goldman Sachs) had been lying about Greece’s budget deficit for years. The bond markets were not amused and demanded far higher interest rates on Greek debt. Far higher interest rates, for a nation already in deep deficit and lacking any sovereign currency, could only create a destructive feedback cycle that would end in default. The EU’s leaders believed that the future of the euro and perhaps the EU were at risk, so they demanded that the ECB step forward to save Greece. The ECB managed to get nearly everything wrong in its dealings with Greece. Even the IMF is distressed by the ECB’s response to the crises of the periphery. The first problem was the most understandable. The ECB took too long to respond to the Greek crisis. Delay was inevitable because the ECB did not have a “lender of last resort” program and had taken the position that it could not and should not have such a program because its sole mission and function were achieving price stability through monetary policy. Nevertheless, delay was very harmful. Greece twisted slowly in the wind, taking substantial economic damage. The ECB appeared to lack decisiveness. Speculation arose that other nations on the EU periphery would also need help from the ECB, which led to attacks on their sovereign debt issuances and damage to their budgets and economies. The ECB compounded the problem by “aiding” Greece by making it loans. Greece’s problems included excessive debt and no sovereign currency, so the ECB’s aid deepened its debt crisis. The ECB did not give Greece grants, which is what it needed. Giving Greece real financial aid, rather than loans was a bridge too far for the ECB. Greece popped a second EU bubble. The second bubble was hyper-inflated by hot air from European politicians (particularly the French and Germans) claiming that the EU and euro were leading the member nations to ever greater political integration and, ultimately, a true “union.” Well, no. Not even close. The EU is moving in the opposite direction. As the Irish columnist David McWilliams aptly observed, it turned out that the Germans didn’t think of the Greeks like the rest of America thought of New Orleans when it was devastated by Hurricane Katrina. They weren’t fellow citizens entitled to draw on the nation’s resources to recover. The French and Germans, the leading proponents of ever greater European unity and solidarity, viewed the crisis as the Greeks’ fault and they believed that the Greeks should pay a stiff price for resolving the self-inflicted crisis. The ECB’s third error was to “channel” IMF policies and demand that Greece – a nation is serious recession – adopt financial austerity during the recession. This, predictably, intensified a recession. The ECB insisted on the same medicine for Ireland and Portugal – and increased unemployment in both nations. Spain, which the ECB is pretending is sound, is covering up its banking crisis. By keeping its real estate values massively inflated Spain is preventing the markets from clearing. Unemployment is 20 (29% in Andalusia and 45% for you young adults). The ruling Socialist party was just crushed in a series of regional elections and will likely fall once national elections occur. Ireland’s and Portugal’s ruling parties fell. Economic stability generates political instability. One of the great paradoxes is that the periphery’s generally left-wing governments adopted so enthusiastically the ECB’s ultra-right wing economic nostrums – austerity is an appropriate response to a great recession. Even neoclassical economists know that the ECB’s policies towards the periphery are insane. The IMF and ECB impose pro-cyclical policies that make recessions worse. Embracing theoclassical economics isn’t simply harmful to the economy, it’s also political suicide. Why left-wing parties embrace the advice of the ultra-right wing economists whose anti-regulatory dogmas helped cause the crisis is one of the great mysteries of life. Their policies are self-destructive to the economy and suicidal politically. Lemmings don’t really follow each other and jump off cliffs – that’s fiction. Left-wing European governments, however, continue to support the ultra-right wing policies that the ECB pushes even when they know those policies will harm the economy and cause the left-wing party to be crushed in the next general election. They watch the ECB’s policies fail and their sister parties lose power and then they step forward to do the same. The old, and very true, line is that there is always at least one fool in a poker game and if you cannot identify the fool within five minutes of joining the game it’s because you are the fool. Ireland has played the fool in its response to the banking and sovereign debt crises. Fianna Fail, gratuitously, turned a banking crisis into a budgetary and sovereign debt crisis and a severe recession into a economic trap that threatens to make Ireland a mini-Japan. Fianna Fail – even after it performed disastrously and was crushed in the general election – thinks it’s a good thing that the ECB and the IMF “commended” Fianna Fail’s policies. Fianna Fail would think it was a good thing if its poker rivals “commended” how well it played poker. Unfortunately, the Irish people provided Fianna Fail’s stakes in this real-world poker game with the Irish banks’ creditors, the ECB, and the IMF. Fianna Fail still thinks the ECB is Ireland’s friend. “Naïve” is inadequate as a descriptor. These three ECB errors combined with the inherent dangers that the euro poses for the periphery. A nation that gives up its sovereign currency by joining the euro gives up the three most effective means of responding to a recession. It cannot devalue its currency to make its exports more competitive. It cannot undertake an expansive monetary policy. It does not have any monetary policy and the EU periphery nations have no meaningful influence on the ECB’s monetary policies. It cannot mount an appropriately expansive fiscal policy because of the restrictions of the EU’s growth and stability pact. The pact is a double oxymoron – preventing effective counter-cyclical fiscal policies harms growth and stability throughout the Eurozone. The additional dangers include the German desire for a very strong euro, which makes it harder for the nations of the periphery to recover through exports. Germany’s ability to export even under a strong euro makes it even harder for the periphery to export. The one area of financial sovereignty that remains for the periphery is debt, and that can easily become a severe threat because, unlike a nation with a sovereign, floating currency, a nation that uses the euro can prove The surging interest expense can cause a feedback into budgetary pressures (brought on by the recession – and aggravated by the ECB austerity) that causes recurrent crises in individual nations and, through contagion, much of the periphery. The ECB has recently compounded these inherent problems of the euro through six additional blunders. It has ruled out debt restructuring and made the argument against restructuring one of morality. The truth is that Greece and Iceland are insolvent. They cannot repay their liabilities. Trying to make them repay their liabilities will further harm their economies and increase ultimate losses. This is why we have bankruptcy laws. It is why the U.S. has non-draconian bankruptcy laws that allow a “fresh start.” This is one of the acts of American genius. It greatly increases entrepreneurial activity by individuals and businesses. It has allowed tens of millions of Americans and tens of thousands of businesses a second chance. Keeping a nation in a grinding economic crisis for a decade is pointlessly inhumane (particularly in a continent that claims to prize European solidarity). It is also self-destructive. It harms the periphery and the core by reducing economic growth and causing a wide range of severe social problems. It is a terrible policy for those that believe in the expansion of the EU to the remaining candidate states. Allowing a fresh start by restructuring debts (a euphemism for partial default) is simply good business. The ECB was foolish to take the best option off the table and to stigmatize it as a moral failure. The ECB then made things worse in a third way by charging Greece and Ireland too much to borrow. The ECB could have finessed the entire “default” and “morality” rhetoric by providing Greece and Ireland with extremely low interest loans repayable over an extremely long time period. This, of course, would have provided a substantial subsidy to Greece and Ireland, which is exactly what they needed (and what the core needed to escape the crisis that was largely created by the core). Instead, the ECB has charged Greece and Ireland relatively high interest rates. Combined with their recessions, budgetary crises, loss of effective sovereign means to counter the recession because they were members of the euro, and the crippling effects of the ECB’s demands for austerity, the effect of the ECB loans has been to make Greece and Ireland’s debt burdens even more unsustainable. The ECB should have explained these realities whenever it discussed the Irish crisis. What should have happened in Ireland, at the minimum, is that the four large, insolvent banks should have been treated as insolvent banks, which was the reality. Bank debts represent contracts. The contract that the Irish banks’ lenders entered into with the banks had these basic terms. As to insured deposits, the contract was that Ireland, in the event the bank failed, would repay us the full amount of our deposit up to the insurance limit. In return, as insured depositors we accepted a lower interest rate from the banks because deposit insurance reduced our risk of loss if the bank failed. To the extent that we lend money to the bank other than through insured deposits we are at greater risk of loss if the bank fails so we are compensated for that risk by receiving a higher rate of interest than do insured depositors. If the bank fails we only get repaid a portion of our debts. That portion depends on how insolvent the banks prove to be. If the banks’ losses on assets are 60% (roughly the loss rate at the worst three Irish banks), then we will receive under 40 cents on the euro (because the administrative expenses of receivership will reduce the pro rata recovery of unsecured creditors). The recovery rate for general creditors becomes even smaller when the bank has secured creditors or other creditors with higher priorities (which can include depositors in the U.S. context). The Irish banks’ general creditor, therefore, already received compensation in the form of higher yield that they deemed adequate recompense for the taking the risk of catastrophic loss in the event the bank failed. To pay general creditors in full when the bank is deeply insolvent is to provide them with a windfall – and to create perverse incentives that would further erode “private market discipline” and make future crises more likely and more severe. The Irish banks’ creditors were supposed to suffer catastrophic losses when the banks failed – that was the deal they made and they decided that the extra yield was sufficient. No one made the creditors loan to the Irish banks. The creditors voluntarily did so to make a lot of euros. The overall impact of all of this is that if the ECB insists on talking in terms of morality and honoring contracts the uninsured creditors should have been the ones to bear the overwhelming bulk of the losses caused by the Irish banks’ insolvency. That’s what their contracts provided. Instead, they are reaping a massive windfall at the direct expense of the Irish people. I must mention in passing a new analysis by Goldman Sachs related to this issue that is so exceptionally bad that it demands response. “IRISH banks would be all but wiped out if the Government was to default or restructure the State’s borrowings because of their vast holdings of Irish bonds and sovereign debt. The title of the article, therefore, is misleading. Ireland’s insolvent banks were “wiped out” years ago when they made epic bad and fraudulent loans. Ireland is insolvent and it does not have a sovereign currency; it cannot afford to convert currently its sovereign debt held by its banks into euros. Ireland’s problem, therefore, is not the consequences of defaulting, but the consequences of failing to default. Goldman is doubly wrong about a debt default causing the failure of the banks. I’ve explained why this claim reverses causality. One, it was the failure of the banks and the insane guarantee that caused the budgetary and sovereign debt crisis and the greatly increased “funding” of the banks with Irish bonds. It was the failure of the banks and the guarantee that made Ireland insolvent and (absent real aid from the EU) makes some form of Irish default inevitable. Two, an Irish debt default would not cause the banks to fail (assuming counterfactually that they hadn’t already failed). If Ireland leaves the euro and reestablishes a floating, sovereign currency the Irish banks’ holdings of Irish bonds will be irrelevant. The fact that AIB and the Bank of Ireland hold Irish debt does not impose any net cost on the Irish government of repudiating debt. Ireland, should it find it desirable, can simply provide AIB and the Bank of Ireland with new Irish bonds or with the new, sovereign Irish currency. The only real issue is whether, and to what extent, it makes sense for the Irish government to subsidize AIB and the Bank of Ireland and what it should receive in return for such aid. The fifth EU blunder has not been limited to the ECB. A series of EU representatives and parliamentarians of individual nation states have decided to demonize the periphery and to “suggest” that the periphery act in a manner designed to humiliate the nations, impair their sovereignty, and create intense enmity towards the core nations. Greece has been told to sell it islands and beaches. This has led to media speculation that it is being asked to sell its national archeological treasures. Prominent representatives of the core nations regularly deride the purported national character flaws of the periphery. The ECB strategy for the recovery of the periphery is for those nations to engage in a “race to the bottom” of wages to “restore competitiveness.” The core has consigned the periphery to a second track – and their track is the road to Bangladeshi salaries. The sixth EU blunder is to threaten not only the periphery but other EU and transnational institutions. The ECB, last week, threatened to cut off all credit to the periphery if Greece entered into a debt restructuring deal brokered by the G-8 or any similar group. The ECB, the least democratic institution in the EU system, seeks to arrogate to itself unprecedented power over EU member nations when they are in crisis. This will produce riots, mass protests, and the return of anarchism in many parts of Europe. The one thing that the citizens of the core and the periphery share is the conviction that “the other” is acting wretchedly and in contravention of ideals underlying the formation and expansion of the EU. Neither the core nor the periphery understands the others’ perspective. The ECB has no idea how much rage it has created in the periphery and the passionate divisions it is creating among Europeans. If the ECB is not curbed it will destroy the European project. The ultimate irony is that it will be the Germans and French who dominate the ECB and represent the two nations that have been the strongest proponents of an ever closer union, who will fracture the union unless they give up their theoclassical dogmas. Imagine two people sitting on opposite ends of a 15-foot teeter-totter. The laws of physics dictate that the seesaw will balance if the product of the first mass (w1) and its distance (d1) from the fulcrum (i.e. the balancing point) is equal to the product of the other mass (w2) and its distance (d2) from the fulcrum. Thus, the physicist can show that the teeter-totter will be in balance when the fulcrum is placed 6 feet from the end holding a 150lb person and 9 feet from the end holding a 100lb person. Moreover, the laws of physics ensure that an imbalance will arise if the mass or the relative position of one of the people is changed. For economists, this is as obvious as stating that a linear foot is the sum of 12 sequential inches. It simply recognizes that the total amount of money spent buying newly produced goods and services will yield an equivalent income to the sellers of these products. Thus, it demonstrates that expenditures are a source of income. Equation  shows that there is a direct relationship between what’s happening in the private sector (S – I) and what’s happening in the public sector (G – T). But it is not the one that Pete Peterson, Erskin Bowles, or President Obama would have you believe. And I want you to understand why they are wrong. To understand the argument, imagine that you and Uncle Sam are sitting on opposite ends of a teeter-totter. You represent the private sector, and your financial status is given by (S – I). 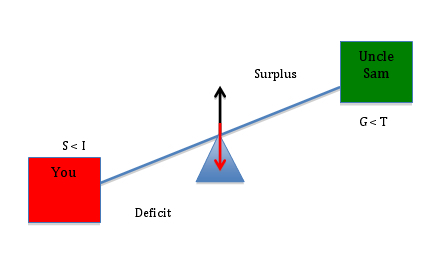 Your budget can be in balance (S = I), in deficit (S < I) or in surplus (S > I). When your financial status is positive (S > I), you are net saving. When your financial status is negative (S < I), you are net borrowing. Uncle Sam’s financial status is equal to (G – T), and, like yours, his budget may be balanced (G = T), in deficit (G > T) or in surplus (G < T). When you interact, only three outcomes are possible. First, it is conceivable that (S = I) and (G = T) so that (S – I) = 0 and (G – T) = 0. When this condition holds, the teeter-totter will level off with each of you experiencing a balanced budget. In the above scenario, the government is balancing its receipts (T) and expenditures (G), and you are balancing your savings and investment spending. There is no net gain/loss. But suppose the government begins to spend more than it collects in taxes (i.e. G > T). How will Uncle Sam’s deficit affect your position on the teeter-totter? The answer is as straightforward as increasing the mass of the person on the right-hand side of the seesaw. As Uncle Sam’s financial position turns negative, your financial position turns positive. This should make intuitive as well as mathematical sense, because when Uncle Sam runs a deficit, you receive more financial assets than you lose through taxation. Put simply, Uncle Sam’s deficit lifts you into a surplus position. Moreover, bigger deficits mean bigger surpluses for you. Finally, let’s see what happens when Uncle Sam tightens his belt. Suppose, for example, that we were able to duplicate the much-coveted surpluses of 1999-2001. What would (and did!) happen to the private sector’s financial position? Because the economy’s financial flows are a closed system – every payment must come from somewhere and end up somewhere – one sector’s surplus is always the other sector’s deficit. As the government “tightens” its belt, it “lightens” its load on the teeter-totter, shifting the relative burden onto you. This is not rocket science, but it appears to befuddle scores of educated people, including President Obama, who said, “small businesses and families are tightening their belts. Their government should, too.” This kind of rhetoric may temporarily boost his approval ratings, but the policy itself will undermine the efforts of the very families and small businesses that are trying to improve their financial positions. * I’ll be back with a second installment that shows what happens when we ‘open’ the economy to take into account the foreign sector (and the relevant financial flows). Many of us have been working with financial balance equations for years (see herefor references), so the current effort is nothing new. I am merely trying to make the arguments more accessible by changing the way they are presented. Breakup of the euro? Is Iceland’s rejection of financial bullying a model for Greece and Ireland? Last month Iceland voted against submitting to British and Dutch demands that it compensate their national bank insurance agencies for bailing out their own domestic Icesave depositors. This was the second vote against settlement (by a ratio of 3:2), and Icelandic support for membership in the Eurozone has fallen to just 30 percent. The feeling is that European politics are being run for the benefit of bankers, not the social democracy that Iceland imagined was the guiding philosophy – as indeed it was when the European Economic Community (Common Market) was formed in 1957. By permitting Britain and the Netherlands to blackball Iceland to pay for the mistakes of Gordon Brown and his Dutch counterparts, Europe has made Icelandic membership conditional upon imposing financial austerity and poverty on the population – all to pay money that legally it does not owe. The problem is to find an honest court willing to enforce Europe’s own banking laws placing responsibility where it legally lies. The reason why the EU has fought so hard to make Iceland’s government take responsibility for Icesave debts is what creditors call “contagion.” Ireland and Greece are faced with much larger debts. Europe’s creditor “troika” – the European Central Bank (ECB), European Commission and the IMF – view debt write-downs and progressive taxation to protect their domestic economies as a communicable disease. At issue from Europe’s vantage point – at least that of its bankers – is a broad principle: Governments should run their economies on behalf of banks and bondholders. They should bail out at least the senior creditors of banks that fail (that is, the big institutional investors and gamblers) and pay these debts and public debts by selling off enterprises, shifting the tax burden onto labor. To balance their budgets they are to cut back spending programs, lower public employment and wages, and charge more for public services, from medical care to education. This austerity program (“financial rescue”) has come to a head just one year after Greece was advanced $155 billion bailout package in May 2010. Displeased at how slowly the nation has moved to carve up its economy, the ECB has told Greece to start privatizing up to $70 billion by 2015. The sell-offs are to be headed by prime tourist real estate and the remaining government stakes in the national gambling monopoly OPAP, the Postbank, the Athens and Thessaloniki ports, the Thessaloniki Water and Sewer Company and the telephone monopoly. Jean-Claude Juncker, Luxembourg’s Prime Minister and chairman of the Eurozone’s group of finance ministers, warned that only if Greece agreed to start selling off assets (“consolidating its budget”) would the EU agree to stretch out loan maturities for Greek debt and “save” it from default . The problem is that privatization and regressive tax shifts raise the cost of living and doing business. This makes economies less competitive, and hence even less able to pay debts that are accruing interest, leading toward a larger ultimate default. But turning debtor economies into a set of tollbooths to sell off remains the predatory textbook financial response. Financial power is to achieving what military conquest did in times past. Pretending to make indebted economies more competitive, the actual aim is to squeeze out enough payments so that bondholders (and indeed, voters) will not be obliged to confront the reality that many debts are unpayable except at the price of making the economy too debt-ridden, too regressively tax-ridden and too burdened with rising privatized infrastructure charges to be competitive. Cutting back public spending and regressive tax shifts dry up capital investment and productivity. Such economies are run like companies taken over by debt-leveraged raiders on credit, who downsize and outsource their labor force so as to squeeze out enough revenue to pay their own creditors – who take what they can and run. The tactic attack of this financial attack is no longer overt military force as in days of yore, but something less costly because its victims submit more voluntarily. But the intended financial victims are fighting back. The attackers are not losing their armies and manpower, but their balance sheets are threatened – and hence their own webs of solvency with which they sought to entrap their prey. Greek labor unions (especially in the public enterprises being privatized), the ruling Socialist Party and leading minority parties rejected the radical sacrifices being demanded by Eurozone officials. The bankers’ response was to insist that Greece respond to its wave of strikes and popular protest by suspending party politics and economic democracy. Financial planning be placed above party politics, and demanded “cross-party agreement on any overhaul of the bail-out.” “The government and the opposition should declare jointly that they commit to the reform agreements with the EU,” Mr. Juncker explained to Der Spiegel. Criticizing Prime Minister George Papandreou’s delay at starting the sale of state assets, Europe’s financial planners proposed a national privatization agency to act as a face-saving “temporary” intermediary. The idea is to transfer revenue from these assets to foreign creditors – and to pledge its public assets as collateral to be forfeited in case of default in payments to government bondholders. Suggesting that the government “set up an agency to privatize state assets” along the lines of the German Treuhandanstalt that sold off East German enterprises in the 1990s,” Mr. Juncker thought that “Greece could gain more from privatizations than the €50 billion ($71 billion) it has estimated,” . And default will become pressing whenever the ECB may choose to pull the plug. It is inevitable, given the debt corner into which governments have recklessly deregulated the banks and cut property taxes and progressive income taxes. Introduction of the euro in 1999 explicitly prevented the ECB or any national central bank from financing government deficits. This means that no nation has a central bank able to do what those of Britain and the United States were created to do: monetize credit to domestic banks and for public spending generally. The public sector has been made dependent on commercial banks and bondholders. This is a bonanza for them, rolling back three centuries of attempts to create a mixed economy financially and industrially, by privatizing the credit creation monopoly as well as capital investment in the infrastructure monopolies now being pushed onto the sales block for bidders – on credit, with the winner being the one who promises to pay out the most interest to bankers to absorb the access fees (“economic rent”) that can be extracted. Politics is being financialized while economies are being privatized. The financial strategy was to remove economic planning from democratically elected representatives, centralizing it in the hands of financial managers. What Benito Mussolini called “corporatism” in the 1920s (to give it its polite name) is now being achieved by Europe’s large banks and financial institutions – ironically (but I suppose inevitably) under the euphemism of “free market economics.” It is the financial counterpart to Hayek’s Road to Serfdom – central planning by Wall Street, the City of London and Frankfurt, not Washington. Language is adopting itself to reflect the economic and political transformation (surrender?) now underway. Central bank “independence” is euphemized as the “hallmark of democracy,” not the victory of oligarchy. The task of such rhetoric is to divert attention from the fact that the financial sector aims not to “free” markets, but to centralize control in the hands of financial managers. Their logic is to subject economies to austerity and even depression, sell off public land and enterprises, and reduce living standards in the face of a sharply increasing concentration of wealth at the top of the economic pyramid. The idea is to slash government employment, lowering public-sector salaries to lead private sector wages downward, while cutting back social services. Latvia is cited as the model success story. Its government slashed employment and public sector wages fell by 30 percent in 2009-10. Private-sector wages followed the decline. This was applauded as a “success story” and “accepting reality” – despite accelerating emigration. So now, the government has put forth a “balanced budget amendment,” to go with its flat tax on labor (some 59 percent, with only a 1 percent tax on real estate). Former U.S. neoliberal presidential candidate Steve Forbes would find it an economic paradise. The internal contradiction (as Marxists would say) is that the existing mass of interest-bearing debt must grow as it receives interest that is re-invested to earn yet more interest. This is the “magic” of compound interest. The problem is that its payment diverts revenue away from the circular flow between production and consumption. Say’s Law says that payments by producers (to employees and producers of capital goods) must be spent, in the aggregate, on buying the products that labor and tangible capital produce. Otherwise there is a market glut and business shrinks – with the financial sector’s network of debt claims bearing the brunt. The financial overhead intrudes into this circular flow. Income spent to pay creditors is not spent on goods and services. It is re-invested in new loans, or on stocks and bonds (assets in the form of financial and property claims on the economy), or on “gambling” (“casino capitalism,” derivatives, the international carry trade – that is, exchange-rate and interest-rate arbitrage) and other financial claims that are independent of the production-and-consumption economy. So as financial assets accrue interest – bolstered by new credit creation on computer keyboards by commercial banks and central banks – the financial rake-off from the “real” economy increases. The idea of paying debts regardless of social cost is backed by mathematical models as complex as those used by physicists designing atomic reactors. But they have a basic flaw simple enough for a grade-school math student to understand: They assume that economies can pay debts growing exponentially at a higher rate than production or exports are growing. Only by ignoring the ability to pay – by creating an economic surplus over break-even levels – can one believe that debt leveraging can produce enough financial “balance sheet” gains to pay banks, pension funds and other financial institutions that recycle their interest into new loans. Financial engineering is expected to usher in a postindustrial society that makes money from money (or rather, from credit) via rising asset prices for real estate, stocks and bonds. It all seems much easier than earning profit from tangible investment to produce and market goods and services, because banks can fuel asset-price inflation simply by creating credit electronically on their computer keyboards. Until 2008 many families throughout the world saw the price of their home rise by more than they earned in an entire year. This cut out the troublesome M-C-M’ cycle (using capital to produce commodities to sell at a profit), by M-M’ (buying real estate or assets already in place, or stocks and bonds already issued, and waiting for the central bank to inflate their prices by lowering interest rates and untaxing wealth so that high income investors can increase their demand for property and financial securities). The problem is that credit is debt, and debt must be paid – with interest. And when an economy pays interest, less revenue is left over to spend on goods and services. So markets shrink, sales decline, profits fall, and there is less cash flow to pay interest and dividends. Unemployment spreads, rents fall, mortgage-holders default, and real estate is thrown onto the market at falling prices. When asset prices crash, these debts remain in place. As the Bubble Economy turns into a nightmare, politicians are taking private (and often fraudulent) bank losses onto the public balance sheet. This is dividing European politics and even threatening to break up the Eurozone. Third World countries from the 1960s through 1990s were told to devalue in order to reduce labor’s purchasing power and hence imports of food, fuel and other consumer goods. But Eurozone members are locked into the euro. This leaves only the option of “internal devaluation” – lowering wage rates as an alternative to scaling back payments to creditors atop Europe’s economic pyramid. Latvia is cited as the model success story. Its government slashed employment and public sector wages fell by 30 percent in 2009-10. Private-sector wages followed the decline. This was applauded as a “success story” and “accepting reality.” So now, the government has put forth a “balanced budget amendment,” to go with its flat tax on labor (some 59 percent, with only a 1 percent tax on real estate). Former U.S. neoliberal presidential candidate Steve Forbes would find it an economic paradise. So “Saving the euro” is a euphemism for governments saving the financial class – and with it a debt dynamic that is nearing its end regardless of what they do. The aim is for euro-debts to Germany, the Netherlands, France and financial institutions (now joined by vulture funds) to preserve their value. (No haircuts for them). The price is to be paid by labor and industry. 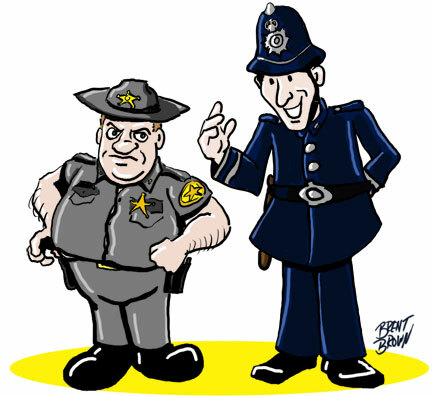 How much austerity is “enough” – for more than the short run? “Helping Greece remain solvent” means, in practice, helping it avoid taxing wealth (“too rich to pay” is the new corollary to “too big to fail”) and roll back wages while obliging labor to pay more in taxes while the government (“taxpayers,” a.k.a. workers) sells off public land and enterprises to bail out foreign banks and bondholders while slashing its social spending, industrial subsidies and infrastructure investment. One Greek friend in my age bracket has said that his private pension (from a computing company) was slashed by the government. And when his son went to collect his own unemployment check, it was cut in half, on the ground that his parents allegedly had the money to support them. The price of the house they bought a few years ago has plunged. They tell me that they are no more eager to remain part of the Eurozone than the Icelandic voters showed themselves last month. I suppose that all that really is needed is for people to understand just what dynamics are at work that make these attempts to pay in vain. Creditors know that the game is up. All they can do is take as much as they can, as long as they can, pay themselves bonuses that are “free” from recapture by public prosecutors, and run to their offshore banking centers. Ambrose Evans-Pritchard, “Iceland offers risky temptation for Ireland as recession ends,” The Telegraph, December 8, 2010. Bernd Radowitz and Geoffrey T. Smith, “Juncker Calls for Greek Privatization Agency,” Wall Street Journal, May 23, 2011, based on Juncker’s earlier interview in Der Spiegel magazine. Peter Spiegel, “Greek assets could go to ‘fund of experts’,” Financial Times, May 24, 2011, Dimitris Kontogiannis, Kerin Hope and Joshua Chaffin, “Greece to sell stakes in state-owned groups,” Financial Times, May 24, 2011, and Alkman Granitsas, “Greece Speeds Up Plans to Sell Off State-Held Assets,” Wall Street Journal, May 24, 2011. Alessandra Galloni and David Gauthier-Villars, “France’s Lagarde Seeks IMF’s Top Job,” Wall Street Journal, May 26, 2011. This article is an excerpt from Prof. Hudson’s work in progress, “Debts that Can’t be Paid, Won’t Be,” to be published later this year. When the euro was launched, leading German politicians used to argue, with evident relish (and much to the chagrin of the British in particular), that monetary union would eventually require political union. The Greek crisis was precisely the sort of event that was expected to force the pace. But, faced with a defining crisis, Ms Merkel’s government is avoiding airy talk of political union – preferring instead to force harsh economic medicine down the throats of the reluctant Greeks, Irish, Portuguese and Spanish electorates. This is becoming both economically and politically unsustainable. If the objective is to save the currency union, perhaps policy makers are looking at this the wrong way around. In the end, paradoxically, to save the European Monetary Union, the least disruptive way forward would be for the Germans, not the periphery countries, to leave. One major reason why political, and social, unification is so important is that it provides conditions under which the adjustment mechanism, to being uncompetitive, is facilitated. Labour mobility is much greater within, than between, countries. Cross-regional fiscal transfers help to smooth the adjustment process. Social and national unity makes break-away policies almost unthinkable and hence provides the cement to keep the discipline of adjustment in place. None of the above are, as yet, strongly anchored in the euro-zone. Nor are they likely to be in the current context in which any moves toward a broader supranational fiscal structure continue to be resisted by the Germans, who perceive this as a backdoor mechanism for yet more bailouts of their “profligate” Mediterranean European “partners”. And yet some sort of broader fiscal expansion is becoming increasingly necessary if the euro project is to be sustained. From a standard Keynesian perspective, shrinking a fiscal deficit is virtually synonymous with shrinking economic growth. Keynesians emphasize the prevalence of multiplier effects. Cuts in government spending and hikes in taxes are expected to reduce incomes and spending in the private economy. If the fiscal consolidation is ambitious enough, it can deliver an outright recession. At the time the euro was launched, there was much hopeful talk that a surge in trade and investment between the euro zone nations would create a truly unified European economy, in which national levels of productivity and consumption would converge on each other. It was also assumed – or perhaps just hoped – that the euro would create political convergence. Once Europeans were using the same notes and coins, they would feel how much they had in common, develop shared loyalties and deepen their political union. The designers of the single currency were hoping for a third form of convergence, between elite and popular opinion. They knew that in certain crucial countries, in particular Germany, the public did not share the political elite’s enthusiasm for the creation of the euro. But they hoped that, in time, ordinary people would embrace the new single European currency. This has clearly not been reflected by the reality. Crudely speaking, the markets today are calculating that governments lack the shared political commitment to underwrite the stability of the single currency. The main disadvantage of adopting a currency union in the absence of a fully fledged political union is that it limits the ability of the constituent regions (countries) to adjust to an (asymmetric) shock by using domestic fiscal policy to mitigate the deflationary impact of this shock, as well as eliminating the ability to deploy exchange rate adjustments to do so. The European Monetary Union doesn’t work and without a federal fiscal redistribution mechanism it will never be able to deliver prosperity. Every time an asymmetric demand shock hits the Eurozone, the weaker nations will fail. Trying to impose fiscal rules and austerity onto the EMU monetary system just makes matters worse. The fiscal austerity that accompanied the period of transition into the EMU as governments struggled to reach the entry criteria established under the SGP manifest now as persistently high unemployment and rising underemployment; vaporising social safety nets; decaying public infrastructure and rising political extremism. Some 10 years after the introduction of the EMU, these problems are increasing rather than decreasing, as the proponents of the system claimed. Already, Greece has disappointed and requires more EU financing than the $150 billion that seemed more than enough a year ago. Despite the very great weakness in the Irish economy, its fiscal deficit still remains at 15% of GDP. The Portuguese finance minister has conceded that the Portuguese economy will contract 2% this year and 2% next year, and these forecasts tend to be optimistic. Portugal’s real GDP was still growing at a 1% pace versus a year ago, but the sequential contraction in the final quarter of 2010 also places that growth path in question (and in fact Portugal’s policy makers have shifted to a forecast of a 2% real GDP recession in 2011 and 2012). No surprise, then, that Portugal is joining Greece and Ireland in seeking loan assistance from the EFSF. Italy’s real GDP growth was the strongest versus a year ago at 1.5%, but the pace of growth was slipping by year end, and Moody’s has recently threatened the country with a debt downgrade. And then there is Spain: As Rob Parenteau has noted recently (“Spain under Strain”), Spain’s recovery through the end of 2010 was primarily a consumer led advance, yet the fundamentals for consumer spending were hardly favorable. The tumble in retail sales growth that began late last year appears to have accelerated to the downside through March of this year. Higher taxes, plus the onset of the global consumption tax, have put the squeeze on consumer spending. The GCT also makes it more difficult for Spain to improve its current account balance. Investors and policy makers are fixated on reducing the fiscal deficit without considering what that requires for the financial balances of other sectors. The fact of the matter is that Spain has tended to run a chronic current account deficit, not a chronic fiscal deficit. The fiscal deficit is to a great extent just an artifact of the sharp reversal in private sector deficit spending that arrived once Spain’s housing boom went bust and the GFC hit. Private sector debt/income ratios are multiples of the government’s, yet all eyes are on containing the public debt/income ratio. Some earnest efforts at restructuring are underway, and early results may be showing up favorably in capital goods production, but unless more heroic efforts are taken to improve the rate of reinvestment of corporate profits in Spain’s economy, growth shortfalls may indeed lead to a destabilizing cycle at a time when the unemployment rate already tops 21%.. This in turn could knock the euro off its perch as expansionary fiscal consolidations become elusive across the eurozone periphery. Investors do not appear to fully appreciate the challenge Spain faces in maintaining an expansionary fiscal consolidation. With three of the five peripheral nations contracting in the final quarter of 2010, and a fourth decelerating markedly, the elusiveness of an expansionary fiscal consolidation in the eurozone periphery is becoming all too evident. That is entirely consistent with the view that the cards may be stacked against an outcome which allows the periphery countries to grow their way out of trouble. Of course, this wasn’t an issue prior to the creation of the EMU, during which each of the member states were sovereign in their own currencies and had their own central banks. That means they were not revenue-constrained and could conduct fiscal policy and monetary policy in a co-ordinated way to best serve the socio-economic interests of their citizens. Which is tantamount to ignoring the real issue: There is no public debt crisis without the Euro. Japan has a public debt to GDP ratio at a level some 2.5 times bigger than the euro zone, yet there is no solvency crisis in Japan. The only reason the euro has hitherto survived to this point is because the ECB has stepped in as the “missing” fiscal agent and keeping the bond markets at bay. As the ECB’s bond purchases have wound down, however, the crisis has intensified, because the ECB remains the only entity in the EMU which has currency sovereignty and can “fiscally fund” member state deficits permanently. Given the central bank’s political resistance to continuing these purchases (largely supported by the Germans) the underlying logic of the monetary system will continue to ensure these on-going crises will spread across the union. Perhaps we’re looking at this the wrong way around: Given the continued German aversion to more broadly-based pan European style fiscal programs, which its populace continues to see as nothing but bailouts for lazy Mediterranean free-loaders, there is another way to solve the euro crisis. Let Germany leave the euro zone. Let’s leave aside the politics for a moment as there are many who believe that a German exit from the euro zone in effect means the end of the euro because a number of other countries would leave. So consider this exercise solely from an economic context: The likely result of a German exit would be a huge surge in the value of the newly reconstituted DM. In effect, then, everybody devalues against the economic powerhouse which is Germany and the onus for fiscal reflation is now placed on the most recalcitrant member of the European Union. Germany will likely have to bail out its banks, but this is more politically palatable than, say, bailing out the Greek banks (at least from the perspective of the German populace). To be sure, this will not come without some cost to Germany: Germany will probably save its banking system at the expense of destroying its export base. The newly reconfigured DM will soar against the euro and become the ultimate safe haven currency. This will mitigate the write-down impact of the inevitable haircuts on euro-denominated debt, because the euro (assuming it is retained by the remaining euro zone countries) will fall dramatically. Even if the euro itself vaporizes, the Germans simply will pay back debt in the old currencies, likely fractions of their previous value. And the German populace would likely find it far more palatable to be bailing out its own banks (as it did during the reunification period), as opposed to spending German taxpayer funds to recapitalize the banking systems of a bunch of Mediterranean “profligates”. By the same token,, a fall in Germany’s external surplus means a large increase in the budget deficit (unless the private sector begins to expand rapidly, which is doubtful under the scenario described above), so Germany will find itself experiencing much larger budget deficits. In the current German situation, although the country runs a large current account surplus, it is insufficient to offset a high private sector predisposition to save (which means there is some deficit). But the current account surplus does allow for a smaller budget deficit than its so-called “profligate” Mediterranean neighbors, whilst still facilitating the private domestic sector’s desire to net save. As we have argued before, it is the “profligacy” of Germany’s Mediterranean trading partners, which has allowed it to rack up huge current account surpluses, and therefore run smaller budget deficits than the likes of the so-called PIIGS countries. Once divorce from the euro is complete, Germany will regain its fiscal freedom. This is itself something the Germans should celebrate, providing their government takes advantage of their newfound fiscal freedom. Remember, once it returns to the Deutsche Mark (DM), Germany becomes the issuer, as opposed to the user of a currency, as is the case under the euro, and is fully sovereign in respect of its fiscal and monetary policy. Consequently, the German government can offset the external shock by running large government budget deficits, which will add new net financial assets to the system (adding to non government savings) available to the private sector. Germany might well decide not to adopt this course of action, given its historic resistance to aggressive fiscal policy, but it will no longer be bound by any of the institutional constraints inherent in the European Monetary Union. In the meantime, the rest of the euro zone gets a huge boost to competitiveness via a (likely) substantial fall in the euro against the newly reconstituted DM. Also, the resultant potential instability means that the ECB would likely have to stand ready to backstop all of the bonds to prevent this from becoming a fully-fledged crisis, but it would encounter less political resistance to doing so, given the absence of a restraining German voice in the European Monetary Union. It seems like an odd way to consider the problem, but the paradox of the current situation suggests that an exit from the euro zone of its strongest member, rather than its weakest links, might well be the optimal means of saving the euro, in the absence of a fully fledged return to separate national currencies. Roger Lowenstein has just taken the brave step of praising the failure to prosecute elite financial managers for fraud as a demonstration of the greatness of America. Lowenstein declares (1) that Blankfein was right – Goldman really was doing “God’s work,” (2) virtually no financial elites committed crimes, (3) any crimes they may have committed were trivial and played no material role in causing the crisis, (4) those that wish to hold fraudulent elites accountable for their crimes are (a) financially illiterate, (b) paranoid conspiracy theorists equivalent to those claiming the U.S. attacked the twin towers on 9/11, (c) a threat to our democracy and constitutional rights, and (d) engaged in “punishing profit,” (5) the prosecutors who refuse to bring criminal charges where they find elite frauds are the heroes safeguarding our democracy and constitutional rights, (6) the FBI is conducting a “serious” investigation of the elite financial frauds (despite points one through four above), and (7) the crisis was caused by “society” – because we’re all guilty no one should be held accountable – except those paranoids who want to destroy America’s greatness by prosecuting financial CEOs on fraud charges. I join Lowenstein and Sorkin in denouncing the demagogues that denounce America’s financial CEOs for fraud and corruption and those that denounce our economic system for cronyism. My research has detected the ravings of two of the worst examples of this form of parasite. Two of the nation’s leading financial commentators have filled their books and columns with demagogic attacks on the productive class. Here are some of one’s vicious assaults on America’s CEOs and capitalist system. The author goes on to describe how senior corporate officials routinely engage in accounting fraud to make “the number” and maximize their bonuses. He stresses the complicity of the outside auditors and banks in aiding accounting control fraud. He claims that at investment banks: “the system was designed for cronyism” (emphasis in original). Indeed, he offers a comprehensive account of the criminogenic environment that creates the incentive and ability to engage in fraud with impunity. The author claims that the officers that control accounting frauds like Adelphia successfully manipulate banks by creating conflicts of interest because they believe that doing so will make it more likely that banks will fund their frauds – and he charges that our most elite banks are eager to be suborned and to turn a blind eye to the underlying fraud. In others words, if the banks lent the Rigases/Adelphia money, then Adelphia would spill some gravy onto their investment-banking divisions. When the bankers saw that, their mouths watered. This was exactly the sort of conflict that Glass-Steagall had been intended to prevent. The banks went for it. From 1999 to 2001, three banking syndicates, led by Bank of America, Bank of Montreal and Wachovia Bank, allowed the Rigases/Adelphia to borrow a total of $5.6 billion, a staggering sum. Citigroup, J.P. Morgan, Deutsche Bank and scores of other banks participated. Anyone looking for mere gaps in the Chinese wall is missing the larger point: banks weren’t trying to separate departments but to integrate them. That was the whole reason they had lobbied for Glass-Steagall’s repeal. Thus, the banks would send teams of 8 or 10 investment bankers and commercial bankers — no distinction was evident, according to Tim Rigas — to Adelphia pitching every financial service under the sun. This is precisely the kind of attack on the Justice Department that Lowenstein decries. It is, of course, inconceivable that the Bush administration would have proven even more opposed to regulating and prosecuting elite white-collar criminals than the Clinton administration. The author writes that the Rigases involved facts so egregious that any honest lender should have refused to lend to them. The author claims that capitalism has become corrupt because of our elites’ power and class advantages. The same author has written about the major role that fraud played in the current crisis. [World Savings’] “loan applications [were] so rife with fraud, that the quality of their book was as suspect as WaMu’s. Indeed, the author’s logic compels the view that the loans were on the wrong side of the fraud “border.” As the author describes the lenders, loans, and rating agencies that drove the crisis, the lenders knew that the borrowers could not repay the loans and the credit rating agencies willfully failed to determine whether the loans could be repaid because they would not have liked the answer had they inquired. The author doesn’t conclude that the loans are fraudulent because his analytics are so weak, but the facts he provides are damning. The context is that a rating agency, Moody’s, permitted him to examine an exemplar of a mortgage-backed security (MBS) (whose identity was disguised from the author and referred to as “XYZ”) collateralized by nonprime loans that it rated in 2006. The author notes that all of the loans backing the MBS were subprime – the lenders knew they were loaning money to borrowers with serious credit deficiencies. The author reports that this was only one aspect of why the loans’ were exceptionally likely to default. Moody’s learned that almost half of these borrowers — 43 percent — did not provide written verification of their incomes. This is naïve because the author has, elsewhere, noted that Washington Mutual’s loans were “rife with fraud.” Andre Cuomo, when he was New York’s Attorney General, found that WaMu kept a blacklist of appraisers – and that one got on the list by refusing to inflate appraisals. No honest lender would ever inflate appraisals, but doing so optimizes accounting control fraud. Only the lenders and their agents, not the borrowers, can cause widespread inflation of appraisals. This means that the borrowers on liar’s loans commonly had negative equity in their homes from the day they purchased the house – they overpaid for the homes. The lenders and their agents, by inflating the appraisals, deceived less sophisticated borrowers about the value of their homes and placed them in a position where they were highly likely to lose the home and their very limited savings. The lenders and their agents’ primary reason for inflating the appraisal was to lower the reported loan-to-value (LTV) ratio. By falsely reporting a lower LTV ratio the lenders increased the ease of securing “AAA” ratings from a rating agency and the premium they could receive by selling the loan. The author’s naïve acceptance of Moody’s claims continues in his explanation of why the rating agencies gave ludicrously inflated ratings to MBS “backed” largely by fraudulent loans structured to have exceptionally high default rates. In the frenetic, deal-happy climate of 2006, the Moody’s analyst had only a single day to process the credit data from the bank. The analyst wasn’t evaluating the mortgages but, rather, the bonds issued by the investment vehicle created to house them. The first clause is absurd. Moody’s did have “access to the individual loan files.” The claim that Moody’s was rating the bonds, not the underlying assets, is absurd. The bond derives its value (and risks) from the underlying mortgages. The only way to reliably evaluate the credit risk of a nonprime MBS was to review a sample of the loans. The author concedes that all Moody’s had to do to get access to the underlying mortgages was to say it would not rate securities unless it could sample loan quality. “Fitch’s analysts conducted an independent analysis of these files with the benefit of the full origination and servicing files. The result of the analysis was disconcerting at best, as there was the appearance of fraud or misrepresentation in almost every file. Fitch also explained why these forms of mortgage fraud combine with “layered risk” to cause severe losses. Note that Fitch, like Moody’s, places the onus for fraud solely on the borrowers rather than the rating agencies’ customers. This is understandable, but false. Because the author naively assumes that Moody’s could not review a sample of loans so that they could determine their credit risk the author does not ask the central analytical question – why did the rating agencies consistently refuse to sample the asset quality of nonprime loans that were known to be pervasively fraudulent. If the rating agencies had reviewed a sample of the loans we know what they would have found – exactly what Fitch found. That would have made it impossible to rate the securities above a “C” rating – virtually certain to default. The author explains the rating agencies’ perverse incentives to give the desired “AAA” rating. The author does not understand the logic of facts he reports, but those facts explain why the rating agencies adopted the financial version of “don’t ask; don’t tell.” The one thing they could never do was actually review the credit risk of the securities they were rating. If they looked, they would document the endemic fraud and never get paid. If even a few rating agencies reported that fraud was endemic among liar’s loans the entire secondary market in nonprime loans would have collapsed and the rating agencies’ most lucrative source of fees would have disappeared. Their profits surged, Moody’s in particular: it went public, saw its stock increase sixfold and its earnings grow by 900 percent. The author disagrees sharply with Lowenstein. He believes that the lenders and rating agencies saw the “classic signs” of a bubble before the bubble collapsed. The author, however, again displays naiveté about ARMs. The author neglects two critical aspects of “teaser” ARMs. First, the lenders “qualified” borrowers on the basis of their purported ability to repay the initial – far lower – “teaser” interest rate. An honest lender would not do so because it would ensure extreme default rates. Second, the very low rates delayed the defaults, optimizing and extending accounting fraud. The facts that the author report are not “classic signs of a bubble” but rather classic signs of accounting control fraud. While the author does not use the phrase, the facts he report demonstrate that the investment and commercial banks that created the nonprime securities deliberately and successfully generated a Gresham’s dynamic (bad ethics drives good ethics out of the marketplace) among the rating agencies by “shopping” their business to the least ethical rating agency. [A]fter you get past the pandering sound bites, a question comes to mind: is anyone in the corner offices of Wall Street’s biggest firms or corporate America’s biggest companies paying any attention to Mr. Holder’s “strong message”? That’s because in the two years since the peak of the financial crisis, the government has not brought one criminal case against a big-time corporate official of any sort. Instead, inexplicably, prosecutors are busy chasing small-timers: penny-stock frauds, a husband-and-wife team charged in an insider trading case and mini-Ponzi schemes. This is the first of a multi-part response to Lowenstein’s column. The remaining columns will address why control fraud drove the current crisis and respond to Lowenstein’s strawman arguments. The sources of the quotations used in this column, from Messrs. Lowenstein and Sorkin, are provided below. Roger Lowenstein, The End of Wall Street (2010); Origins of the Crash: the Great Bubble and its Undoing (2004); Origins of the Crash: the Great Bubble and its Undoing (2004). Bill Black is an associate professor of economics and law at the University of Missouri-Kansas City. He is a white-collar criminologist, a former senior financial regulator, a serial whistle blower, and the author of The Best Way to Rob a Bank is to Own One. He blogs primarily on the UMKC’s economics department’s blog: NewEconomicPerspectives. Bloomberg recently solicited a column from him on the role of fraud in the crisis. He also discussed the role of fraud in the crisis extensively with Harry Shearer on Le Show. This is the fourth and final article in a series of pieces discussing the claim by a Cato scholar at CIFA’s recent meeting in Monaco that formal benefit-cost tests by economists were essential to prevent regulatory excess. The second column focused on a speech in 2001 by Mitch Daniels, then President Bush’s Office of Management and Budget (OMB) director to the Competitive Enterprise Institute (CEI). Daniels is the nation’s leading proponent of benefit-cost tests, and the purpose of his speech was to advance arguments in favor of OMB economists’ use of benefit-cost tests to block the adoption of regulations. The column discussed Daniel’s use of a “mistress metaphor” to explain why economists’ formal benefit-cost tests are vital. This is the third article in a series of pieces discussing the claim by a Cato scholar at CIFA’s recent meeting in Monaco that formal benefit-cost tests by economists were essential to prevent regulatory excess. The second column focused on a portion of a speech in 2002 by Mitch Daniels, then President Bush’s Office of Management and Budget (OMB) director to the Competitive Enterprise Institute (CEI). Daniels is the nation’s leading proponent of benefit-cost tests, and the purpose of his speech was to advance arguments in favor of OMB economists’ use of benefit-cost tests to block the adoption of regulations. The second column discussed Daniel’s use of a “mistress metaphor” to explain why economists’ formal benefit-cost tests are vital. This column focuses on Daniels’ dismissal of benefit-cost analysis when it demonstrates an inconvenient truth. A word about Daniels’ host is in order to understand the raucous laughter his misogynist memes about how wives should not object to their husbands taking a mistress produced among his audience. The CEI is a group funded by the usual anti-regulatory firms. CEI’s mission is to oppose regulation. I wrote in my first column of the embarrassing spectacle of theoclassical economists (with a track record of getting economics disastrously wrong) trying to become amateur climatologists denying global climate change. CEI, largely funded by Exxon, and acting through a non-scientist (much less a climatologist) exemplifies this embarrassment. What’s particularly humorous is that CEI decries “junk science.” What I didn’t learn until researching the context of Daniels’ speech to CEI is that he too is an amateur climatologist. “The issues that now face our country often require a technical understanding, or a grasp of statistics, or cost-benefit analysis, or an appreciation of the scientific method with which the general public is not equipped, and which our politicians neither understand nor particularly want to. Let’s take just one example. A relentless project has inundated Americans for years with the demand that we must drastically reduce the carbon dioxide we emit as a society. It is asserted that the earth is warming; that this warming would have negative rather than positive consequences; that the warming is man-made rather than natural; that radical changes in the American economy can make a material difference in this phenomenon…. Although there are scientists, and scientific studies, that are deeply skeptical of all these claims, they are rarely heard in what passes for public debate. The debate, so far, has been dominated by “experts” from the University of Hollywood and the P.C. Institute of Technology. One can see from this address why CEI was a totally safe venue for Daniels. But what happened to benefit-cost analysis in Daniels’ discussion of global climate change? The benefits of controlling global climate change, according to what even Daniels’ concedes in his speech is a consensus of climatologists, are exceptionally large. Daniels could argue that the costs of limiting global climate change exceed those benefits, but that is not what he argued in his commencement address. (For good reason, he would be hard pressed to demonstrate that the costs exceeded the benefits.) Instead, he argues that we should disregard the experts’ consensus because doing so is congenial with Daniels’ anti-governmental ideology. If the OMB economists can pick and chose their science whenever there is any scientific dispute – even where there is a scientific consensus – then benefit-cost tests become a sham designed to hide the fact that their anti-regulatory ideology. Mitch Daniels abandoned sound benefit-cost analysis on global climate change because it would have demonstrated an inconvenient truth – government intervention is essential to restrict global climate change. Cead mile failte romhat – one hundred thousand greetings to you from Dublin. My UMKC economics department colleague and I are presenting ideas on how Ireland could respond to its banking, budget, and financial crises. Again, one cannot compete with unintentional self-parody. Daniels chose a metaphor to defend benefit-cost tests that lays bare many of the worst aspects of formal benefit-cost tests by economists. Daniels delights in his tale of how an unfaithful, rich, powerful, and older man cheats on his wife, humiliates her in public, and essentially prostitutes his wife and his mistress. Perhaps the worst aspect – and here Daniels is simultaneously acute and clueless – is the wife’s use of the word “ours.” When elites use their dominant power to exploit and corrupt less powerful people they also seek to impose a false construct on their victims that makes them appear to be beneficiaries rather than victims. The macho male meme is that his domineering control of his wife’s life and decisions constitutes “protecting” his wife. She is supposed to perceive and express a debt of gratitude rather than resentment to her oppressor. The wife in Daniels’ ode to benefit-cost tests is not looking for a “three-way.” She gains nothing from the mistress except the humiliation of having the affair rubbed publicly in her face. Her husband is not interested in her. She is simply useful to his career in certain social roles. He wants to avoid an expensive divorce that might hurt his social standing. He is willing to cheat on the woman with whom he has exchanged the most sacred vows and shared the closest relationship. He is someone who makes it clear he cares only about his pleasure — shareholders, creditors, and customers are simply suckers to be looted. His wife may well know about how he cheated them and the IRS. Elite husbands that cheat have special reasons to fear the fury of a woman scorned, deceived, humiliated, and divorced. So what is this “ours” nonsense? The “lovely, much younger woman” is her husband’s mistress. The husband’s complete degradation of his wife occurs if he can use his power and wealth to cause her to come to view the “lovely, much younger woman” as “our” mistress. Daniels’ decision to use this degrading illustration as his exemplar of benefit-cost analysis is also unintentionally revealing about absurd applications of such analyses in which they create the illusion of rational decision-making but recurrently produce tragedy. First, why did the wife have only two choices – accede to the husband’s taking of a mistress or seek a divorce that would cause her a dramatic loss of wealth? The husband could have ended his affair or he could have agreed to a divorce in which he provided her with far greater support. She could have remained married but taken a lover. (Would the husband have viewed him as “our” lover?) OMB economists can frame the alternatives considered (and excluded) to secure the result of the benefit-cost “test” that they desire. Second, for most women, the critical factors that they would weigh in deciding how to respond to learning that their husband had taken a mistress would be impossible to quantify. Do they have kids? What will be the effects of the divorce on them? Would the harm to the kids be reduced if they were older? Does she want to try to save the marriage? How probable is it that he will end the affair and become faithful to her? Does she love him? Can she live and her children live independently without his income and assets? Assume that the wife is initially so desirous of continuing to avoid the end of: “diamonds on your birthday, fewer of those shopping trips to New York, [and] … the country club charge account?” that she decides not to divorce him. How long can this last? As the husband and mistress become even more open about their sexual relationship, and as the mistress increasingly receives the jewels and shopping trips and maxes out the country club charge account – will the wife view the relationship as a “net benefit” and the mistress as “ours”? As she is progressively humiliated in front of her children, relatives, and friends by the relationship will she view the relationship as a net benefit? I think virtually all of us believe that the scenario that Daniels’ sets up as the optimal decision derived from benefit-cost analysis will end badly and harm her and kids severely. In the end, economic benefits and costs are rarely as important as human views of love, respect, and dignity. Formal benefit-cost tests run by economists are typically driven by the economic benefits and costs rather than the aspects of life more important to humans. This creates a systematic bias that makes benefit-cost tests more likely than not to produce the wrong answer as to net benefits. Next week’s column explores Daniel’s application of benefit-cost analysis to science, morality, consumer protection regulation, and the financial crisis. Should Irish Voters Follow the Example Set by Icelandic Voters? Voters in Iceland have rejected their government’s attempt to foist on them the costs of bailing out foreign creditors. Iceland’s oversized big banks had made bad loans throughout Euroland and when they failed uninsured depositors were on the hook. Governments in countries like the UK and the Netherlands bailed out their depositors and demand that Iceland reimburse them. However, Icelandic voters have now rejected that proposition twice. They feel they have suffered enough already from a financial crisis created by largely unregulated financial institutions that lent indiscriminately in foreign currency. Iceland does not use the euro and its tiny economy cannot be expected to cover all the euro-denominated debt run-up by private financial institutions. Those foolish foreigners who took risks by holding uninsured euro-denominated deposits in Icelandic banks with no access to a government back-stop in euros should take the loss. In my view, the voters have responded in a rational and responsible manner. After all, that is what market discipline and sovereignty are all about. If a saver does not like risks, she should hold only safe assets guaranteed by a sovereign power. What about Ireland—which is now facing a similar situation—should its voters reject a taxpayer bailout of foreign creditors? Like Iceland, it faces a crushing debt because its government took on the liabilities of its oversized banks who also had lent indiscriminately throughout Euroland. However, unlike Iceland, Irish bank liabilities are denominated in the currency used in Ireland, the euro. Ireland abandoned its sovereign currency when it joined the Euro. Effectively, it became like a US state—think Louisiana—within the EMU. This means it has little domestic policy space to use monetary or fiscal policy to deal with crisis. If we go back to 2005, Ireland’s government had the second lowest ratio of debt to GDP (national output or income) in the EU-15, with only Luxemberg having a lower debt ratio. The government paid an interest rate similar to that paid by the French and German governments; it had a strong AAA rating on its debt. In fact, it was running a huge government surplus of 2.5% of GDP (similar to that run by the Clinton administration in the late 1990s in the US). Fast forward to this spring. The government deficit ratio was about 12.5% of GDP and credit default spreads on the government’s debt (equivalent to betting on default) reached almost 43 basis points over those of Germany, and it paid 6 percentage points higher to borrow than Germany did (on March 22 the spread on two year bonds hit a record 835 basis points—8.35 percentage points—over the rate on equivalent German debt). Here’s the problem. There is a fundamental relation between economic growth and ability to pay interest to service debt. To be safe, a non-sovereign government should not pay an interest rate that significantly exceeds its growth rate. (A country that pegs its currency, operates a currency board, adopts a dollar standard, or adopts a foreign currency is by my definition “non-sovereign”.) If we compare Ireland today to the situation of Germany, because the Irish government pays 6 percentage points more, it needs to grow 6 percentage points faster than Germany does. To be sure this is a rough rule of thumb and there is some leeway. But the prospects for Ireland to grow that much faster than Germany—say 8 percent growth rate for Ireland versus 2 percent for Germany—approach a zero probability. Indeed, the conventional way to generate government revenues needed to service debt is to cut government spending and raise taxes—which will only hurt Irish growth. Further, what Ireland needs is to increase the flow of euros in its favour through its foreign balance, i.e. by reducing imports and increasing exports to the EMU. The conventional prescription is slow domestic growth to reduce imports and enhance international competitiveness. This, too, further reduces domestic growth even further below the interest rate paid on government debt. And that is precisely the plan adopted by Europe’s policy elite: the “Review of Labour Cost Competitiveness” released by Forfas on 29 October 2010 makes wage reduction its primary goal, while a report, “Ireland-Stability Programme Update”, was presented to the European Commission last month with a plan to “restore order to the public finances” through “an ambitious programme of structural reform” by increasing “competitiveness”. It is clear that the plan is to crush the economy to reduce living standards sufficiently to make Ireland a low-cost producer relative to the rest of Europe. However, with the exception of the BRICs (Brazil, Russia, India and China) recent economic data across the globe have not been good. That makes it harder for Ireland to export its way out of debt—which is the least painful path. I do not see alternatives means of earning the needed euros that are without substantial suffering. Yet, many other EU nations are in a similar situation (even if some are less dire)—and will be competing with Ireland’s rush to the bottom. This is not a battle Ireland is likely to win. Unfortunately, slow growth of the economy usually means slow growth of tax revenue. It is fairly easy to imagine a scenario in which domestic austerity actually makes the budget deficit worse, which raises interest rates on government debt. A vicious cycle can be created, with debt service blowing up as growth continues to slow and interest rates rise with credit ratings agencies downgrading government debt. What I am going to say next will sound quite controversial. Ireland transitioned from a government budget surplus of 2.5% of GDP to a deficit of 12.5% of GDP, which I am arguing is a disaster. The US government has had a nearly identical transformation (from 2.5% surplus in the late 1990s to a deficit near 12.5% of GDP today) but it faces no insolvency constraint and no default risk. The reason this is controversial is because we do face deficit hysteria in the US and a threat by credit ratings agencies to downgrade US government debt. Congress nearly refused to extend the self-imposed debt limit on the federal government—and it is still possible that the government might get shut down if Congress refuses to raise the limit in the future. So it might look like the US and Ireland are in a similar pickle. But they are not. All problems in the US are self-imposed. Irish problems are largely imposed by “markets”—by market assessment that there is a very real chance of involuntary default. That is why Irish borrowing rates are rising, while US government interest rates actually fell (!) after the threatened downgrade. The only path to US default is political—failure of Congress to raise debt limits. The path to Irish default is “economic”—spiralling interest rates with low growth rates. If Ireland had its own sovereign currency, the size of the government deficit or debt ratio would not be relevant to ability to pay. I will return to that below. But since Ireland gave up its currency in favour of the euro, it is not in the position of a USA or a Japan or a Turkey. It has far less domestic policy space—to run up budget deficits to boost growth, and to set low domestic interest rates. Nor can Ireland devalue the currency—the value of its euro is set at equal to the euro used throughout the EMU. As we have seen, crises in various EMU nations (Greece, Portugal, Spain, Ireland) do not cause the euro to depreciate. That might sound counterintuitive but what matters is that there are relatively safe havens for those who want to buy euro-denominated debt, such as Germany. The “periphery” nations have to pay big premiums over the interest rates paid by Germany—and the euro remains (too) strong. But let us look at how Ireland got into this mess. As I mentioned earlier, Ireland was the “paragon of virtue” just 6 years ago—its total outstanding government debt was just 8 months of tax revenue (publicly held debt was only 21% of GDP) and it was actually running budget surpluses. Then the financial crisis hit. That would have worsened the budget balance significantly—and probably would have generated a budget deficit. However, the government chose to guarantee its banks—which were vastly oversized relative to the size of the economy. That “busted the budget” and generated the current problems. In important respects, Ireland reproduced the Icelandic problem, with similar results. As we know, the people of Iceland have recently voted to undo the bank bail-out. The question is how Ireland might respond to the will of its voters. Any rational response should try to undo the mess created by guaranteeing bank debt. A recent report by Finnish bank expert Peter Nyberg avoids naming names (by contrast, the US official report on the crisis—the Financial Crisis Inquiry Report does so) but says that guaranteeing the banks was based on “insufficient information”. Well, that information is now sufficient to conclude that the bail-out was a mistake. It needs to be unwound. The documents must be made public. The guilty need to be prosecuted. Funds need to be recovered. Guarantees of crooks need to be withdrawn. The case for Ireland to withdraw guarantees of bank liabilities is even stronger than the case for Iceland. Iceland wanted to guarantee only the deposits of its domestic residents, while allowing banks to default on those held by foreigners. In the case of Ireland, foreign creditors held large sums of subordinated debt and uninsured deposits. For years they had received higher returns on those inherently risky claims; but when the chickens came home to roost, foreign governments like the UK and the Netherlands chose to bail-out these holders (in many cases, their banks were the holders). That is bad policy, but it was their choice. Obviously, it rewards excessive risk taking, that presumably was already once rewarded by high returns. But now those governments want the Irish government to reimburse them for their foolish policy. I do not (yet) want to recommend outright default on government debt. Public hearings on the bail-outs need to be undertaken immediately to determine what role fraud played in creating the government debt crisis. I’m not a lawyer, but government actions based not just on “insufficient information” but rather on “fraudulently constructed information” need to be undone. Exactly how that will play out through the courts I cannot forecast. As for the foreign government claims, Ireland ought to welcome them to pursue their case in court. Their claims appear to me to be without merit—but one never knows how courts will rule. At the very least, Ireland could buy a lot of time by going to court. Meanwhile, Ireland needs jobs. A universal job guarantee is the best approach. The jobs would pay basic wages and benefits with a goal to provide a living wage. It would take all comers—anyone ready and willing to work, regardless of education, training, or experience. Adapt the jobs to the workers—as the late Hyman Minsky said, “take the workers as they are” and work them up to their ability, and then enhance their ability through on the job training. The program needs to be funded by the central government. Wages would be paid directly to the bank accounts of participants for working in the program. Some national government funding of non-wage costs could be provided. I would decentralize the program, to allow local governments and not-for-profit service organizations to organize projects. Now here is the problem. A sovereign government with its own currency can always financially afford such a program. Ireland could fund such a program with its own sovereign currency. In current circumstances this is problematic because Ireland abandoned its currency in favour of a foreign currency, the euro. The big advantage of a sovereign currency is that government can “afford” anything for sale in its own currency. To keep our analysis simple, government then spends through “keystrokes”, crediting bank accounts. Before all the Zombie Zimbabwean hyperinflation warriors attack, let me say that too much government spending can be inflationary and can create pressures on the currency. But by design a job guarantee program only hires people who want to work because they cannot find higher paying jobs elsewhere. It sets a wage floor but does not drive wages up. As such, it can never cause hyperinflation—it hires “off the bottom” at the program fixed wage, only up to the point of full employment. It never drives the economy beyond full employment. What is the best way to guarantee long-term stability for the Irish economy? Full employment with reasonable price stability—something a universal job guarantee program can deliver. For a sovereign currency nation the interest rate is a policy variable and has no impact on solvency. Government can keep rates low (it sets the overnight rate directly, and can if it desires issue only short maturity bonds near to that rate) and pays interest through “keystrokes” by crediting bank accounts with interest. It can never run out of keystrokes so will never fail to make interest payments unless it chooses to do so for noneconomic reasons. For Ireland, this is a very serious problem. It does not have a sovereign currency. It cannot control its borrowing rates, which are set in markets. Nominal interest rates should not exceed nominal GDP growth rates. But as we know, markets have pushed rates to 10%. For Ireland to service debt at 10% interest rates, it will need Chinese growth rates. That seems unlikely. So how should the government deal with loan repayments to the EU? As I discussed, I would encourage the government to unwind its guarantees of bank debt. If this cannot be done, then Ireland must have a bail out and debt relief provided by the ECB or the EMU through some other entity. That is actually in the interest of the EMU since much of the bank debt guaranteed by Ireland’s government is held externally by EU banks. The last resort alternative is default on debt and possible expulsion from the EMU. That will be painful. There isn’t anything Ireland can be expected to do without support from the EU—except for default. So Ireland can learn from the Icelandic example. Both are heavily indebted because their banks were far too large and made too many foreign loans. A difference is that Iceland still has its own currency; however its banks made loans in foreign currencies. But in important respects, so did Irish banks since the euro is a foreign currency from the perspective of Ireland. Iceland’s citizens are pressuring its government to undo the bail outs. Ireland’s population can learn by example. The Irish voters should demand accountability of government, including investigation of the bail out of banks. Government should pursue debt relief on all fronts. Voters should resist austerity programs. If all else fails, they should demand either default or withdrawal from the EMU (in practice these probably amount to the same thing). And they demand jobs at decent pay. A Universal Job Guarantee program either funded by a newly sovereign Irish government, or funded by the ECB or other EMU institution is necessary to help revive the economy and to relieve suffering caused by high unemployment. William Black was interviewed recently on KCRW’s Le Show with Harry Shearer. Listen below.